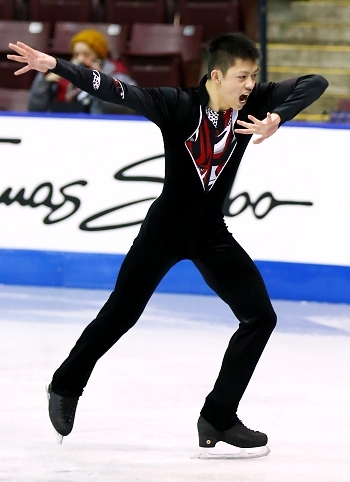 Anthony Kan performs his Short Program at the 2013 Canadian National Figure Skating Championships. Three junior men have set themselves up for a battle for the medals at the 2013 Canadian Tire National Figure Skating Championships on Wednesday morning. Just over three points separate Anthony Kan (CO), Denis Margalik (CO), and Nicolas Nadeau (QC). Kan is quite familiar with being near the top of this field. He won the silver medal at Challenge last month and he was the 2012 Canadian novice national champion. His program to Memorial was dramatic and intense, and a solid opening triple Lutz-triple toe loop combination vaulted him into the lead despite a fall on his double Axel later in the program. “It hasn’t happened in a while, but [the mistake] has happened before,” Kan said while chuckling about missing the easiest jump in his short program. He also smiled and laughed when he got up from the ice after the fall during his performance. Aside from that momentary break, the 17-year-old was fully committed to the story of his program, from his outstretched hands to his maniacal facial expressions. He scored 60.67 (33.75/27.92) points. Margalik had a cleaner skate than Kan, but only did a triple Lutz-double toe loop combination, as opposed to Kan’s triple-triple. The difference for the combination was a little less than three points. He skated in the first group and had to wait for over an hour to see how his score would hold up. At the end of the event, Margalik was thrilled to be in second. The teen, who was born in Buenos Aires, Argentina, finished second with 58.71 (32.46/26.25) points. Margalik was only 12th at Challenge to qualify for these championships, but he was not too worried about improving his position today. He performed his Chopin short program with a lot of freedom, skating much bigger than many other skaters of his 5’4″ height are able to do. “I tried to let all of my nervousness and stress out, and have fun. I think that really helped me out there,” he said. Nadeau, who won the bronze medal in the novice event in 2012, also skated relatively cleanly. He had to squeak out his triple toe loop-triple toe loop combination, but the 7.15 points he received for that element helped keep him in podium position, over three points ahead of the rest of the field. His quirky and humorous program was markedly different from the other top finishers, and he scored 57.09 (29.75/27.34) points. Leslie Ip (CO), is in fourth place with 53.87 points. The 17-year-old is on track to secure his best national finish yet since 2009, his first year at the junior level. Last year, he was 11th at the novice level, and he was also the 11th qualifier at Challenge this season. Mathieu Nepton (QC), the 2011 Canadian novice silver medalist, is back on track this year after missing the qualifying events last season. With 51.33 points, he is currently in fifth place. The 18-year-old is a very lyrical skater, with long lines and sweeping body movements, but seemed a bit disconnected with the performance in his face. Roman Sadovsky, the champion from Challenge last month and a Junior Grand Prix medalist from this season, unfortunately had to withdraw from this event. He fractured his foot last Thursday.